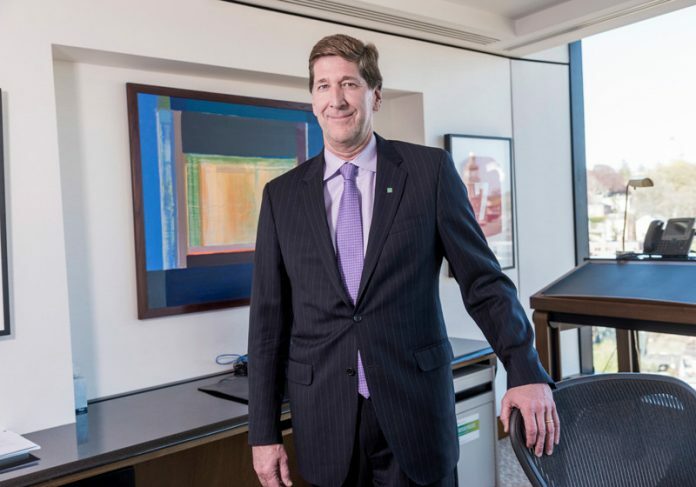 PROVIDENCE – Citizens Financial Group Chairman and CEO Bruce Van Saun earned $9.4 million in 2018, according to a company filing with the U.S. Securities and Exchange Commission. The Citizens’ CEO earned a base salary of $1.5 million for the year, received a cash bonus of $2.5 million and $5.3 million in stock awards. Van Saun also earned $196,000 in “other compensation,” which consisted of a company contribution of $16,500 to a 401(k), a charitable matching contribution of $50,000, dividend equivalents paid in cash of $93,016 and $36,484 worth of the cost of personal use of a car and driver, and the cost of financial planning services. One year prior, Van Saun earned $8.5 million, the sixth-highest compensation of an executive of a company headquartered in Rhode Island or Bristol County, Mass., according to the 2019 PBN Book of Lists. Donald H. McCree III, vice chairman and head of commercial banking at Citizens, earned $3.9 million in 2018, including a base salary of $700,000, bonus payments of $997,500, stock awards of $2.2 million and $12,602 in other compensation. McCree was the No. 17 highest-paid executive of a publicly traded company headquartered in Rhode Island or Bristol County, Mass. John F. Woods, vice chairman and chief financial officer of the company, earned $3.6 million, including $700,000 in base salary, $900,000 in bonus earnings, $1.9 million in stock awards and $64,859 in other compensation. In 2017, Woods was the fifth-highest paid executive of a company headquartered in Rhode Island or Bristol County, Mass., earning $9.1 million. The company’s Vice Chairman and Head of Consumer Banking Brad L. Conner was paid $3.1 million in 2018, including $700,000 in base salary, $735,000 in bonus, $1.6 million in stock awards and $69,929 in other compensation. Conner earned $3 million in 2017, No. 21 on the list of highest-paid executive of a publicly traded company headquartered in Rhode Island or Bristol County, Mass. Malcom Griggs, the company’s executive vice president and chief risk officer, was paid $2.2 million in 2018, including a base salary of $519,231, a bonus payment of $710,368, stock awards of $878,958 and other compensation of $71,194. Based on other information provided in the filing, the median total compensation of all employees at Citizens in 2018 was $59,748. Based on that, Van Saun’s compensation to median compensation ratio was 157 to 1.